The Mercedes-Benz R107 and C107 automobiles were produced from 1971 through 1989, being the second longest single series ever produced by the Mercedes-benz automaker, after the G-Class. They were sold under the SL (R107) and SLC (C107) model names. The R107 replaced the W113 SL-Class in 1972 and was replaced by the R129 SL-Class in 1989. The SLC replaced the W111 Coupé in 1971 and was replaced by the C126 S-class coupe in 1981. The R107 took the chassis components of the mid size Mercedes-Benz W114 model and mated them to the larger engines from the S-Class (W116). The SL variant was a 2-seat convertible/roadster with standard soft top and hardtop and optional folding seats for the rear bench. The SLC (C107) derivative was a 2 door hardtop coupe with normal rear seats. The SLC is commonly referred to as an 'SL coupe', but in reality it was an S-class coupe, replacing the former saloon-based 280/300 SE coupé in Mercedes lineup. 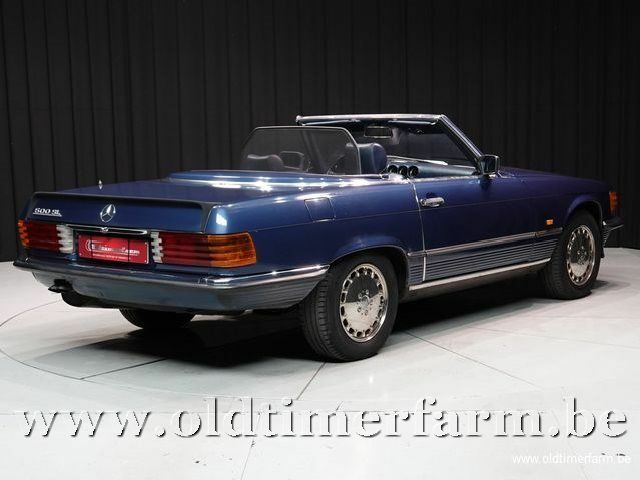 The SLC was replaced earlier than the SL, in 1981, with a much larger model, the 380 SEC based on the new S class. Volume production of the first R107 car, the 350 SL, started in April, 1971 alongside the last of the W113 cars; the 350 SLC followed in October. Sales in North America began in 1972, and cars wore the name 350 SL, but had a larger 4.5L V8 (and were renamed 450 SL/SLC for model year 1973); the big V8 became available on other markets with the official introduction of the 450 SL/SLC on non-North American markets in March, 1973. US cars sold from 1972 through 1975 used the Bosch D Jetronic fuel injection system, an early electronic engine management system. 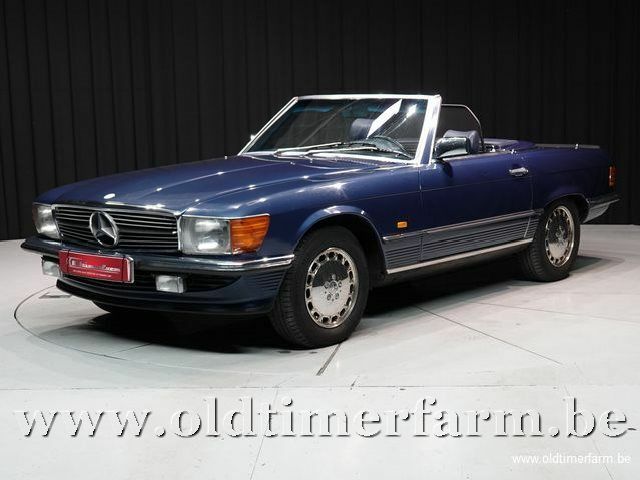 From July, 1974 both SL and SLC could also be ordered with a fuel-injected 2.8L straight-6 as 280 SL and SLC. US models sold from 1976 through 1979 used the Bosch K Jetronic system, an entirely mechanical fuel injection system. All US models used the 4.5 liter engine, and were called 450 SL/SLC. In September, 1977 the 450 SLC 5.0 joined the line. This was a special version of the big coupé featuring a new all-aluminum five-liter V8, aluminum alloy doors, hood and trunk lid - and a black rubber rear spoiler. Starting in 1980, US cars were equipped with lambda control, which varied the air/fuel mixture based on feedback from an oxygen sensor. The 350, 450 and 450 SLC 5.0 models (like the 350 and 450 SL) were discontinued in 1980 with the introduction of the 380 and 500 SLC in March, 1980. At the same time, the cars received a very mild makeover; the 3-speed automatic was replaced by a four-speed unit, the 280 models came with a standard 5-speed (formerly a 4-speed) manual and all five-liter cars gained a black rear spoiler lip. The 280, 380 and 500 SLC were discontinued in 1981 with the introduction of the 126 series 380 and 500 SEC coupes. A total of 62,888 SLCs had been manufactured over a ten year period of which just 1,636 were the 450 SLC-5.0 and 1,133 were the 500 SLC. Both these models are sought by collectors today. With the exception of the SL65 AMG Black Series, the SLC remains the only fixed roof Mercedes-Benz coupe based on a roadster rather than a sedan. Following the discontinuation of the SLC in September, 1981, the 107 series continued initially as the 280, 380 and 500 SL. At this time, the V8 engines were re-tuned for greater efficiency, lost a few hp and consumed less fuel, helped by substantially numerically shorter axle ratios (that went from 3.27:1 to 2.47:1 for the 380 SL and from 2.72:1 to 2.27:1 for the 500 SL). From September, 1985 the 280 SL was replaced by a new 300 SL, and the 380 SL by a 420 SL; the 500 SL continued and a 560 SL was introduced for certain extra-European markets, most notably the USA. Also in 1985, the Bosch KE Jetronic was fitted. The KE Jetronic system varied from the earlier, all mechanical system by the introduction of a more modern engine management "computer", which controlled idle speed, fuel rate, and air/fuel mixture. The final car of the 18 years running 107 series - 500 SL painted Astral Silver was built on August 4, 1989 and it currently resides in the Mercedes-Benz museum in Stuttgart, Germany.